On Thursday, February 22, the boys varsity team was supposed to play Indianapolis Light House, though due to a scheduling mishap, the away team didn’t show. Instead of canceling the JV team scrimmaged and the seniors were still honored. 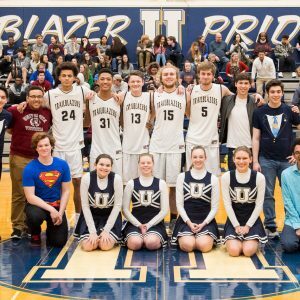 That night was senior night for the boys, along with the cheerleaders and pep band, and was celebrated in a unique fashion. Each player was announced along with the college they aim to attend. Ethan Sickels plans to go to Ball State, Josh Watson to Dartmouth, David Howard to NYU, Zack Hodgin to Depauw, and Foster Flamion to Indiana University. The cheerleaders also announced their chosen colleges with Becca Blank going to Kenyon College, Becca Elliot choosing Winona State, and Juliana Messina still undecided. Many special thanks were also given by Coach Lafferman to Dr. Cosby, along with the rest of the team, who later presented him with a game ball signed by all the players. 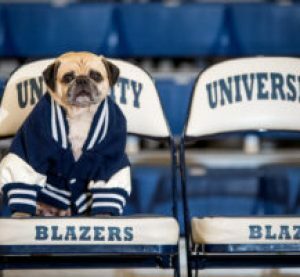 Lafferman continued to boast about how his players managed exceptional GPAs, putting the “student” first in “student-athlete.” Special thanks were also made by the boys to Mr. and Mrs. Walls, Mr. and Mrs. Webster, Dr. Cosby, and Kris Schepers. In true University fashion, the crowd went wild for the JV scrimmage while the Varsity players coached. The senior night may not have gone as it was originally planned, but it ended in lots of laughs and smiles from both the seniors and the fans.